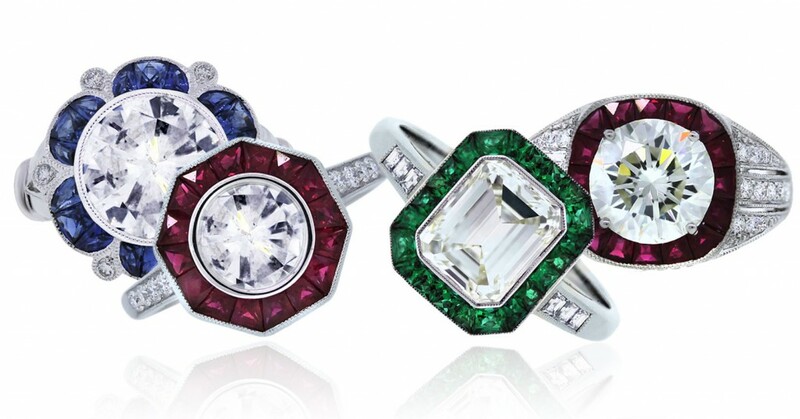 Gemstones and Birthstones are among the many customization options offered at Diamonds by Raymond Lee. Meaningful gems provide many couples with a sentimental option for their engagement rings, whether they want to use a precious birthstone or the gem that represents the month of their anniversary. 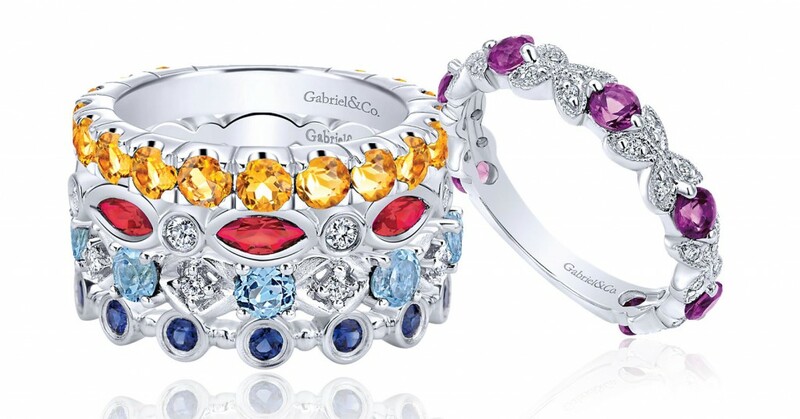 Several of our prestige designer lines offer precious gems as custom options in their settings. As is the case with diamonds, any treatments done to enhance a precious gem should always be disclosed to the customer. Most treatments on precious gems are done to better the color of the gem, and can be long lasting and permanent or short lived (and sometimes at the expense of the original stone.) Regardless, treatment should always be disclosed, as it makes a gem look more valuable than it is naturally, and those savings should always be passed on to the customer. When it comes to semi-precious stones, like topaz and aquamarine, color is still important, though personal preference creates more variation in what’s most valuable. Clarity and size are bigger factors. These stones are gorgeous additions to our settings, and can be used to create more fashion-forward pieces than traditionally bridal looks. 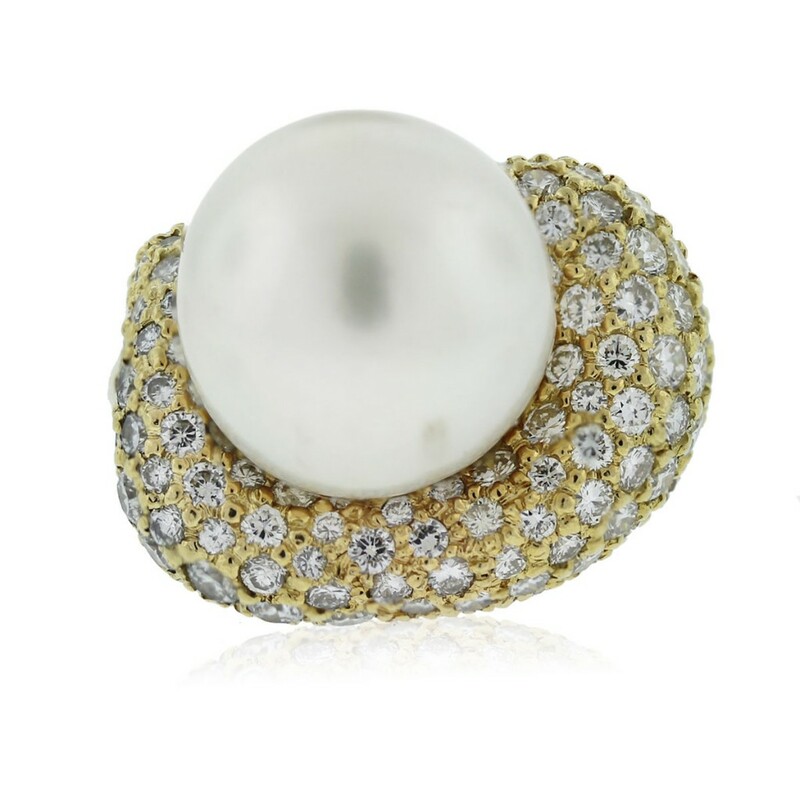 Pearls, like diamonds, have a set of defining characteristics all their own. However, unlike gemstones that form within the earth, pearls are the beautiful byproduct of oysters and other mollusks.When a grain of sand or other foreign object finds its way inside a clamshell, the mollusk attempts to heal by building layers of nacre, the same material that makes up the inner shells of the mollusk. The layers smooth out over time, and the end result is a beautiful pearl. Pearls formed naturally are expensive because of their rarity. However, cultured pearls make up the majority of today’s pearl market, and are much more readily available. It’s the same process, but helped along by placing an object inside the mollusks and placing them in warm water to grow the pearls over several years. This has helped the growing demand for various pearl shapes, colors, and sizes. Determining a pearl’s value depends on several factors, and the way they all interact with each other to produce the most beautiful, jewelry-quality pearls. Luster is the combination of surface brilliance and glow, it is affected mainly by the thickness of the iridescent layers of nacre that make up the pearl. Because of the huge variety of pearl colors in both natural pearls and man-made cultured pearls, no one color is more valuable. Rather, the depth of color is what’s important. 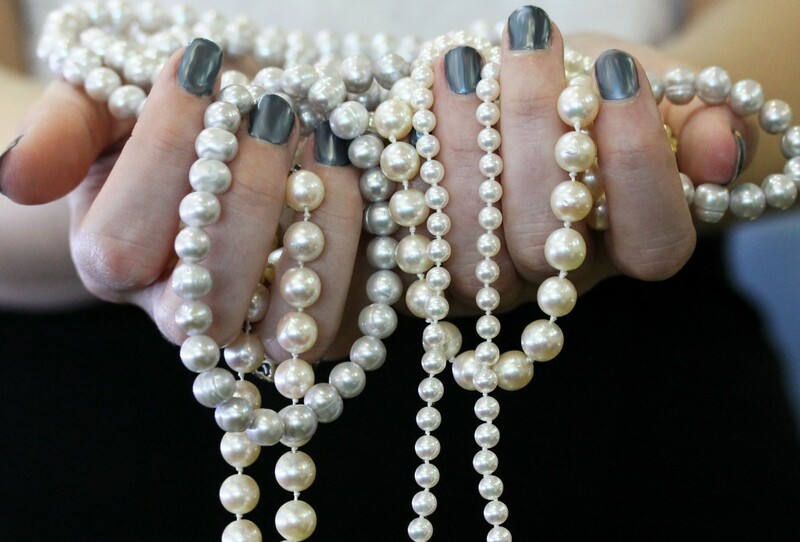 Pearls are measured in millimeters, not carats. However, just like diamonds, the bigger the pearl, the more its price goes up. Pearls range from a fraction of a millimeter (like seed pearls) to giant South Sea pearls. It’s no surprise that round, symmetrical pearls are the most valuable (because they are the rarest.) The smoother, and cleaner the pearl’s surface, the more valuable the pearl is. Pearls are also priced based on where they come from. 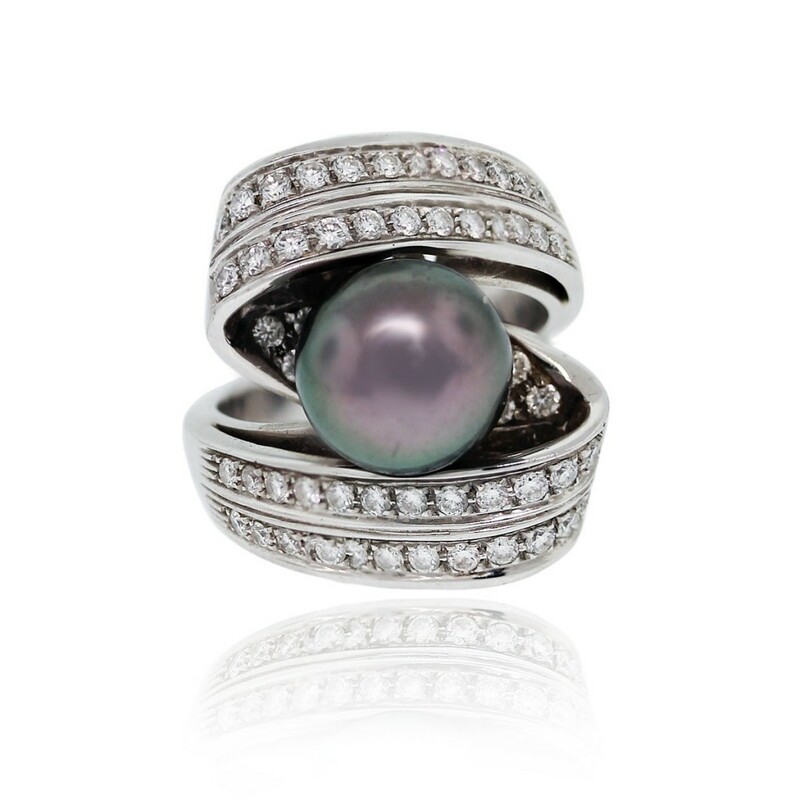 Tahitian pearls are cultured from black lip oysters in the South Pacific, and typically come in larger sizes. They are famed for their rich, dark colors like black, green, gold and even garnet. South Sea pearls are the most valuable pearls, highly prized for their impressive sizes. They are grown from white lip oysters in Australia, Indonesia and the Philippines. Akoya pearls are most likely what you imagine when you picture the classic pearl. They hail from Japan and China, and come primarily in creamy white, ivory, and rosy hues. They are notable for their luster. These pearls are the most plentiful and affordable pearl option, cultured in freshwater mussels.